Spring Onions or Scallions are small immature plants of lily (allium) family root vegetables such as onion, shallots…etc. Precisely speaking, the term spring onions denote to the bulb, including its top greens of Allium fistulosum (Welsh onion), a sub-species in the broad onion (allium) family, especially in the west. 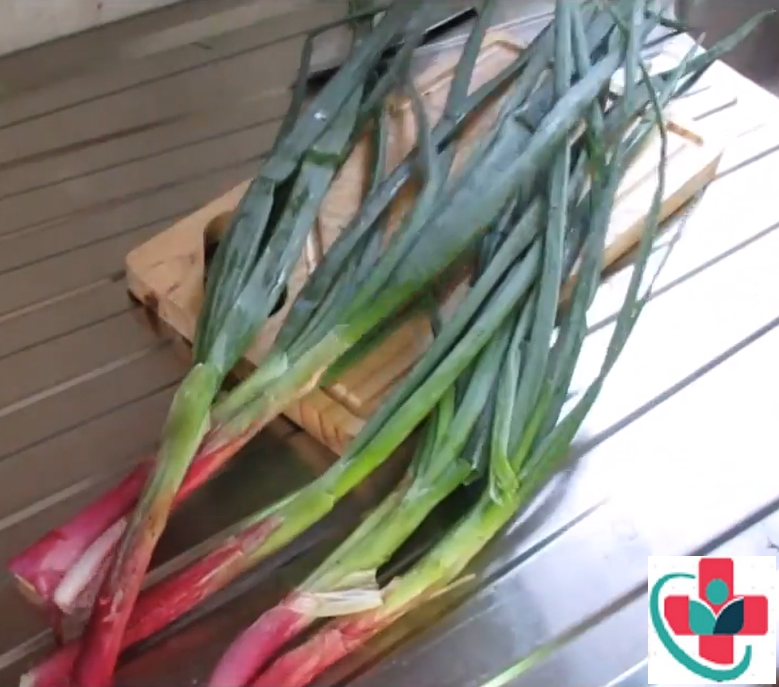 Some of the common names used are spring onions, green bunching onions...etc. In general, spring onions are young immature plants harvested very early before the plant grows further big, and its bulb becomes larger. For the same purpose, the crop is planted closely in the field in order to stunt their bulb's growth. Unlike its fellow members such as A.cepa (onion), and A.cepa aggregatum (shallots) which produce large underground bulbs; Allium fistulosum (welsh onion) are non-bulging and cultivated for their top crispy greens. Allium fistulosum is a perennial native to the Central Asian region and now widely cultivated in many parts of Europe, Americas, and Asia. Generally, on the cross-section, welsh onion leaves are round whereas, the other varieties feature semicircular tubules. Scallions feature long, slender, erect stalk rising above a small, elongated root (bulb) from which multiple straight; hollow, tubular leaves grow. Scallions are very low in calories; 100 g of fresh leaves provide just 31 calories. Nonetheless, they contain many noteworthy flavonoid anti-oxidants, plant fiber, minerals, and vitamins that have proven health benefits. Being leafy-greens, scallions naturally contain more plant-derived antioxidants, and dietary fiber than their fellow allium members like onions, shallots, etc. 100 g fresh spring onions provide 2.6 g or 7% of daily-recommended levels of fiber. Scallions, like leeks, possess proportionately less thio-sulfinates anti-oxidants than that in the garlics. Thio-sufinates such as diallyl disulfide, diallyl trisulfide and allyl propyl disulfide convert to allicin by enzymatic reaction when its leaves disrupted (crushing, cutting, etc). Laboratory studies show that allicin reduces cholesterol production by inhibiting the HMG-CoA reductase enzyme in the liver cells. Further, it also found to have anti-bacterial, anti-viral, and anti-fungal activities.Allicin decreases blood vessel stiffness by release of nitric oxide (NO); thereby bring a reduction in the total blood pressure. In addition, It blocks platelet clot formation and has fibrinolytic action in the blood vessels, which helps decrease an overall risk of coronary artery disease (CAD), peripheral vascular diseases (PVD), and stroke. Spring onions contain healthy composition of vitamin-A (997 IU or 33% of RDA per 100 g) and other flavonoid phenolic anti-oxidants such as carotenes, zea-xanthin, and lutein. Together, they help the body protect from lung and oral cavity cancers. They also have some other essential vitamins such as vitamin C, and K. In fact; scallions are one of the richest sources of vitamin K. 100 g of fresh greens provides 207 µg or about 172% of daily-recommended intake of this vitamin. Vitamin K has a potential role in bone health by promoting osteotrophic (bone formation and strengthening) activity. Adequate vitamin-K levels in the diet help limiting neuronal damage in the brain; thus, has established role in the treatment of Alzheimer's disease. Spring onions are plentiful in B-complex vitamins as well as some essential minerals such as copper, iron, manganese, and calcium. The leafy greens contain several vital vitamins such as pyridoxine, folic acid, niacin, riboflavin, and thiamin in healthy proportions. 100 g fresh leaves provide 64 µg of folates. Folic acid is essential for DNA synthesis and cell division. Their adequate levels in the diet during pregnancy can help prevent neural tube defects in the newborn babies.